Ko Samui island of Surat Thani Province (or Koh Samui, Thai: เกาะสมุย, Thai pronunciation: [kɔ̀ʔ samǔj]), or often, simply Samui as it is referred to by locals, is an island off the east coast of the Kra Isthmus in Thailand, close to the mainland Surat Thani town and in Surat Thani Province. It is Thailand’s second largest island, with an area of 228.7 km2 and a population of over 50,000 (2008) attracting 1.5 million tourists per year. It is rich with natural resources, white sandy beaches, coral reefs and coconut trees. The island was probably first inhabited about 15 centuries ago, settled by fishermen from the Malay Peninsula and Southern China. It appears on Chinese maps dating back to 1687, under the name Pulo Cornam. The name Samui is mysterious in itself. Perhaps it is an extension of the name of one of the native trees, mui, or from the Malay word Saboey, meaning "safe haven". Ko is the Thai word for "island". Until the late 20th century, Ko Samui was an isolated self-sufficient community, having little connection with the mainland of Thailand. The island was even without roads until the early 1970s, and the 15 km journey from one side of the island to the other involved a whole-day trek through the mountainous central jungles. 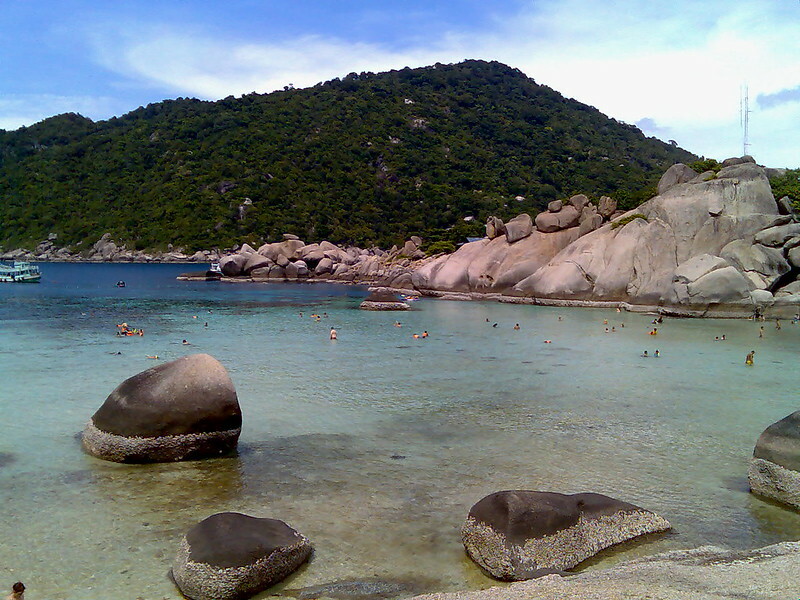 Ko Samui has a population of about fifty-five thousand (source: Samui Mayor’s Office) and is based primarily on a successful tourist industry, as well as exports of coconut and rubber. It even has its own international airport, Samui Airport, with flights daily to Bangkok and other major airports in Southeast Asia such as Hong Kong and Singapore. Whilst the island presents an unspoiled image to the public perception, economic growth has brought not only prosperity, but changes to the island’s environment and culture, a source of conflict between local residents and migrants from other parts of Thailand and other countries. Reflecting Samui’s growth as a tourist destination, the Cunard ship MS Queen Victoria (a 2000-plus passenger ship) docked at Samui during its 2008 world cruise. Image published by greenmarlin on 2009-03-20 18:11:05 and used under Creative Commons license.